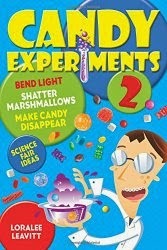 Candy Experiments: Best use of candy corn: Corn Bread or Candy Experiments? Best use of candy corn: Corn Bread or Candy Experiments? Dominique Ansel, creator of the Cronut, suggests families use up leftover candy corn this way: cook it into cornbread! ( *"Cook with Leftover Candy!" Time Oct 27, 2014, page 81) All you need, apparently, is a standard cornbread recipe with 3 oz chopped candy corn, which dissolves into the batter when you refrigerate it overnight. Stir it the next day to mix the dye into the batter, and cook. Of course, if you do, you're still eating all of the sugar and dye you might have been trying to avoid. 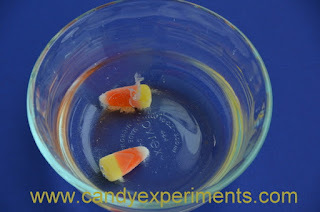 Here's how we play with candy corn: "Skin the Candy" from Candy Experiments. Just drop your candy corn in warm water and watch the glaze peel off like snakeskin.